This quote from Hemingway has always been one of my favorites, and it feels especially fitting today as I return from my little blogging hiatus. I’m so excited to talk books with you again, and I hope I haven’t lost too many of you over my break; right now, that is the truest sentence I know. We have so many things to catch up on—summer reads! Throwback reads! Literary hunks!—but today, as is always the case on July 21, I want to focus on my main literary squeeze, Papa Hemingway, who was born on this day in 1899 and remains as relevant, popular, and incomparable as ever. I’ve written all about my love for Hemingway on this blog, and last year I even dedicated a whole week to him. The truth is, I will never run out of ways to preach about Papa, and today I’m going to preach about one of my very favorite books of his—one of my favorite books, period—A Moveable Feast. Written near the end of his life and published posthumously, A Moveable Feast is Hemingway’s memoir of his days as a young and hungry writer in 1920s Paris. Filled with memories of F. Scott and Zelda Fitzgerald, Gertrude Stein, Ezra Pound, and Hemingway’s first wife, Hadley, the book is as engrossing, insightful, and beautifully written as any of his novels and short stories. Whether recounting the hunger he felt while walking by rows of Parisian bakeries, reminiscing about borrowing books from Shakespeare & Company, or simply describing the changing of the seasons, Hemingway makes you feel that you are right there in the heart of it all. In his Hemingway way, he never uses a spare word, and through the economy of his sentences, he evokes such vividness that you’d swear you were a member of his Lost Generation, sipping a café au lait in a cozy haunt on the Place St.-Michel. There is so much I love about this book. I love its beautiful sentences about knocking on wood and the breathing of the person lying beside you in the moonlight. I love the tender affection Hemingway reveals when talking about Hadley and the emotional hindsight when he says, “I wish I had died before I ever loved anyone but her.” I love the way it reminds us that Hemingway was just another person, that he was a young writer with doubts and dreams before he became known as larger-than-life persona. Mostly, I love the way it talks about writing. There are so many treasures peppered throughout the book about his process and the complete care he gave to his craft. I also love the way my well-read copy smells, but that should come as no surprise. 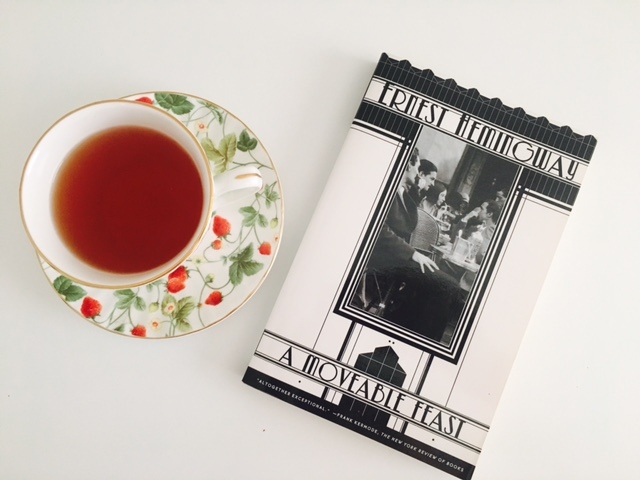 A Moveable Feast is the kind of book I can read again and again, and I’ll find something new to love every time I pick it up. Then again, that’s the way I feel about most of Hemingway’s books, which is why whether he’s writing about an ambulance driver during World War I, a group of expats in Pamplona, the Spanish Civil War, or his days as a starving artist, he will always and forever be my main literary squeeze.